This loop hike will take you through many different landscapes of the Dolly Sod Wilderness. The trail follows a cascading creek with waterfalls and swimming holes, crosses high meadows full of blueberry bushes and patches of old growth forest. WARNING: The trails in the Dolly Sod Wilderness are not blazed and many signs are missing. Make sure to get a map at a local outfitter or campground. Seneca Rocks, WV is nearby and it has a few stores. Before starting your hike, check that Red Creek can be forded on your way back. From the Red Creek trailhead follow the Red Creek Trail (TR514) for about 1.5 miles. The trail will take you close to the river and to a nice campsite. This is the intersection with Big Stonecoal Trail (TR513). Do not cross the river. Continue upstream on the Red Creek Trail for another 1.5 miles and veer left to stay on Red Creek Trail (The trail on the right is Fisher Spring Run (TR510). Cross the river by following the cairns on the other side. 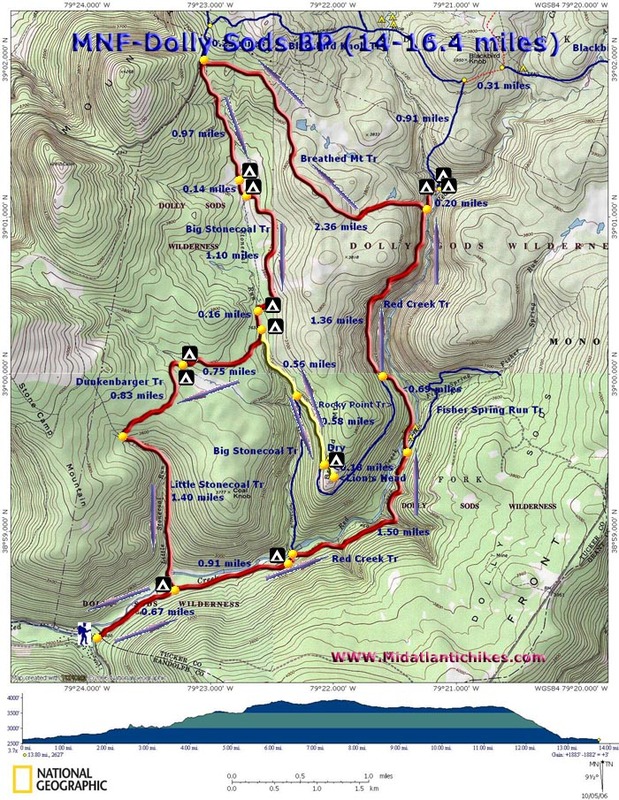 In 0.7 miles after crossing Red Creek you will cross Rocky Point Trail (TR554). Continue for another 1.4 miles until you reach the intersection with Breathed Mountain Trail (TR553). Keep straight on Red Creek Trail for another 0.1 miles to a nice waterfall and swimming hole. This is a nice spot where many people slide down the waterfall and enjoy the swimming hole. Bring your bathing suit! There are also plenty of campsites around. After enjoying this spot, continue another 0.1 miles to "The Forks" waterfall. Once finished, backtrack 0.2 miles to the intersection of Red Creek Trail (TR514) and Breathed Mountain Trail (TR553). Take a right up the mountain onto Breathed Mountain Trail (TR553). After the short uphill you will reach the plateau and meadows of Dolly Sod. Continue through meadows and wooded patches for another 2.5 miles until you come to a big intersection. Take a left onto Big Stonecoal Trail (TR513). After 1 mile you will reach a very nice campsite on your left. After leaving the campsite, continue on Big Stonecoal Trail (TR513) for another 1.4 miles to the intersection with Dunkenbarger Trail (TR558). Leave your backpack at the campsite and continue straight onto Big Stonecoal Trail (TR513) past a nice waterfall. In 0.5 miles make sure to stay straight onto Rocky Point Trail (TR554) and in another 0.5 miles you will reach the Lion's Head overlook. To reach the view, start climbing the boulder field on your left. After enjoying this nice spot, backtrack back to the intersection of Big Stonecoal Trail (TR513) and Dunkenbarger Trail (TR558). Take your packs and follow Dunkenbarger Trail (TR558) 1.7 miles to Little Stonecoal Trail (TR552). This section of the trail is very muddy. Take a left onto Little Stonecoal Trail (TR552). This trail will go steeply downhill for 1.4 miles before reaching Red Creek. Cross Red Creek and follow the access trail back to Red Creek Trail (TR514). Take a right onto Red Creek Trail in in 0.7 miles reach the parking lot. 38.9729492927 degrees / 38° 58.377' / 38° 58' 22.62"
-79.3965625763 degrees / -79° 23.794' / -79° 23' 47.63"